An especially welcome gift for anyone feeling under-the-weather, or perhaps a hospital patient, a gift basket from O'Goodies can be the perfect pick-me-up! The Doctor's Bag contains a great gourmet assortment, including snacks, candy and even chicken soup! We can add orange juice or other small bottled beverages, if you'd like. We are happy to customize for you to the best of our ability - with a special candy bar wrapper, or get well wrapper for bottled water. Other sizes and prices available on special order. You know what they say - an apple a day keeps the DOCTOR away! 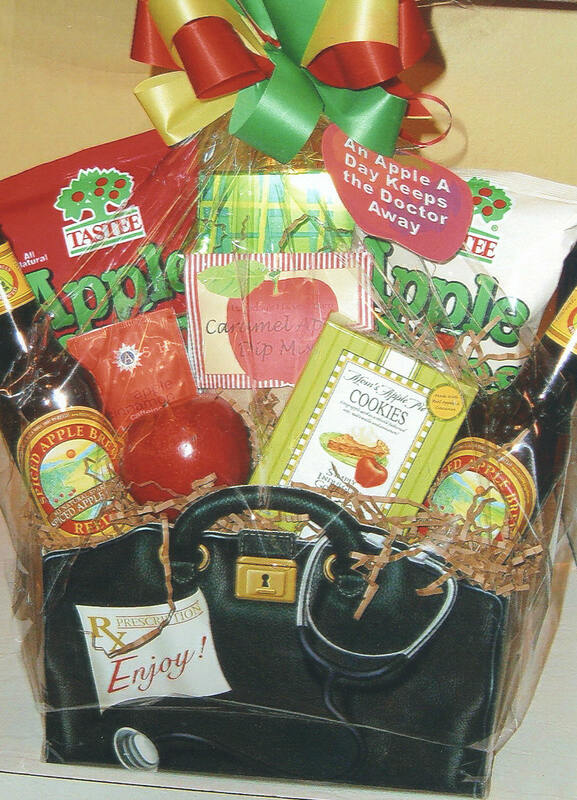 A terrific assortment of apple-theme gourmet goodies is sure to do the same! A wonderfully healthy way to wish someone well! This gift can include fresh apples as well - FRESH FRUIT IS NOT AVAILABLE FOR SHIPMENT.